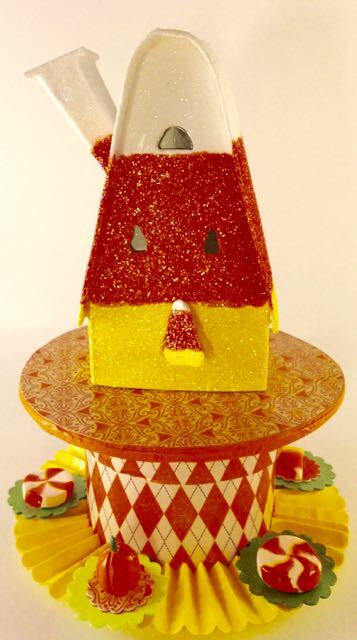 I am always experimenting with different shapes for glitter houses or Putz houses. I made a house 2 years ago based on the shape of Candy Corn because I had never seen a house based on this concept. Below is my favorite. It sits on a round base where the top that comes off to put treats inside. My first attempt at polymer candy decorates the base. Later, I wondered if this shape could be modified into a different house – what about a windmill? Since Spring is on the way, I modified the house to look Springy with bunnies in the garden. That also fits with the theme of this week’s Simon Says Stamp Challenge “In My Garden” though the bunnies are in the Miller’s garden. That is the house at the top of the page – Bunnies in the Garden, Springtime at the Miller’s place. 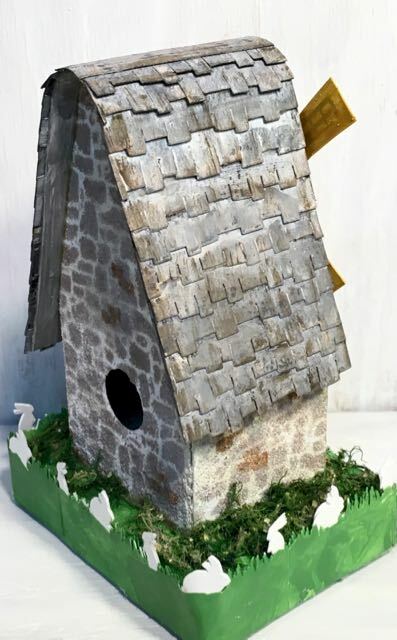 There are number of fun features that go into making this little house – the overall shape with the rounded roofline, the stenciled stone surface, the rotating windmill blades, the shake shingles on the roof, and of course, the little bunnies in the garden. The overall shape is the most important feature. Cardboard pattern for the Miller’s Place house. Notice how the roof is gently scored to allow it to bend around the curve at the roofline of the little house. I will eventually have a pattern for this house available on my website. 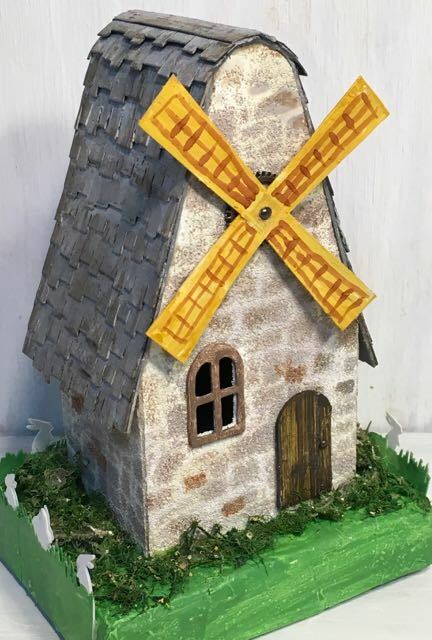 The overall shape makes a unique house that works pretty well as a windmill, though I think the windmill blades need to be larger. When you cut out a house like this it is very important to make sure that the front and back curves match. If you don’t, then wonkiness rears its mismatched head. I managed to cut these out so they are very symmetrical and the roof fits on nicely. I only cut out one window on the front because I didn’t want a window behind the windmill blades. Also, the door was made separately and glued on. If you don’t have to cut out a door so that light shines through it, don’t cut it out. The cardboard house becomes a little less structurally sound if you have a cut at the bottom of the house. I always include the hole in the back as a tribute to old fashioned Putz houses that used the hole for lighting. The first stones I drew bled through the stenciled stones. I thought they looked ok for a little contrast. For some reason I always stencil better on the back than the front. I try to paint the glued seam to disguise it as seen on the right side. 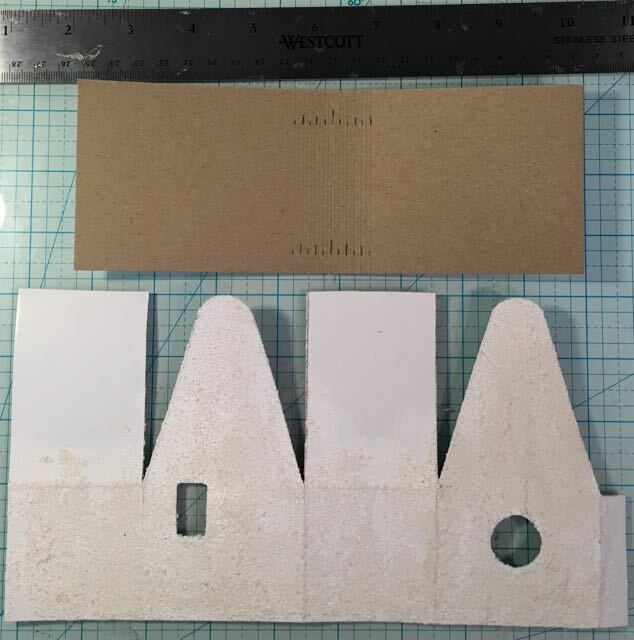 The cardboard was painted with white gesso as the first layer then gesso mixed with Antique Linen Distress Paint and sand for the second layer. The sand gives the house a lovely texture that is perfect to mimic a stone surface. I made this stone surface just as I did the Stone Stenciled Clock House. 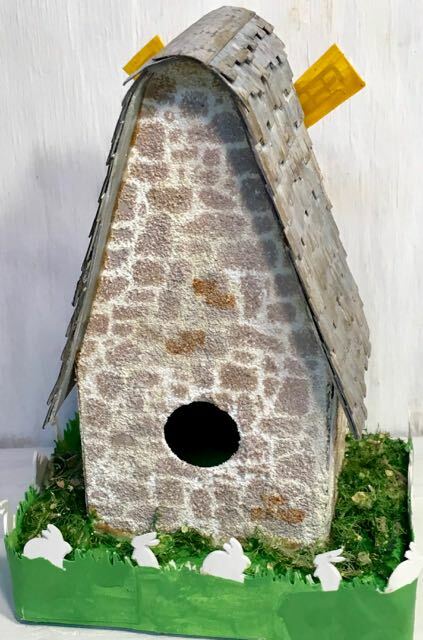 Before gluing the house together, I used the Tim Holtz mini stone stencil by Stampers Anonymous to stencil the surface with various shades of brown and grey. I used the Distress Oxides – Walnut Stain, Frayed Burlap and Hickory Smoke. I did try to draw some stones first with Distress pens, but they didn’t look right so I painted over them. The paint bled through the gesso which I left because I kind of liked the effect. There were some places where I didn’t stencil effectively and you couldn’t see the distinction between the individual stones so I painted more obvious mortar lines with Antique Linen distress paint. Staggered rooftop pieces were painted and distressed, then glued to the roof. After the stenciling, the house was glued together where the tab is located in the back. In order to make the roof curve to fit the pattern, the underside of the cardboard at the roofline was lightly scored in parallel lines to make it more flexible. Then I used my thumbs to bend the cardboard in a U-shape to fit the shape of the house. I applied liberal amounts of Aileen’s Fast Grab glue to the edge of the house and situated the roof piece on the house. Finally I used painter’s tape to hold the roof in place while the glue dried. After the house was glued together, I glued the window shape on the window opening and glued the door on. The roof shingles were made from the Village rooftops die. I painted the roof pieces with hickory smoke distress paint and distressed each piece with various brown distress oxides. I started at the bottom of the roof and layered each level of shingles until I got to the curved top of the roof. I gently curved the last couple of layers with my fingers and left a small gap until the each side of shingles almost touched almost touched at the top. Then I curved a piece of a painted cardboard on the top as the ridge cap. Miller’s Place – The windmill blade rotates on a small brad in the center. An Idea-ology gear glued on the house provides a stable base for the brad. If you want the windmill blade to really rotate, poke a small hole in top part of the house where the blade is to be centered. Very Important point – make sure the front edge of the roof doesn’t extend past the edge of the house so the windmill blades can rotate. 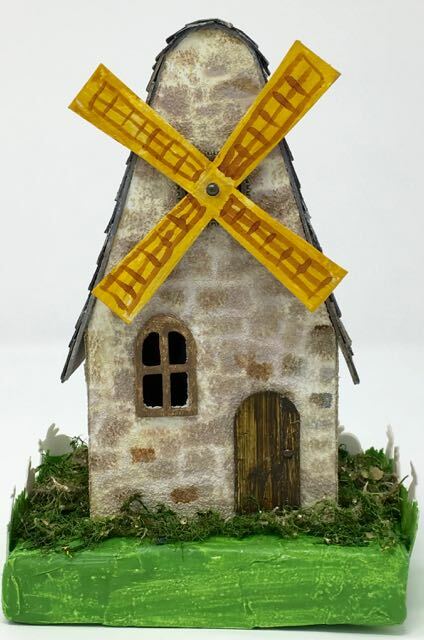 I used a small brad that was long enough to go through all the layers of cardboard and allow the windmill to rotate. And finally you need to realize this important fact – that if you have a moving part on your little house, children will play with it. They will play with the little house no matter what, but a moving part makes it even more compelling to a child. Glue together six layers of corrugated cardboard with hot glue in the size you choose. I cover the rough cardboard edge with torn strips of white scrap paper glued on with collage medium. The base for this house is small about 4″ x 3″. Normally I make a bigger base, but since this is basically an experimental house, I made it small. This base does have a square cut out in the center of the base large enough for an LED light to fit inside to light up the only window. I painted the base with Mowed Lawn Distress Paint because I love this green. It is so perfect for a Springtime house. The house was then glued in place with the Aleene’s Fast Grab glue. I dyed some moss with Mowed Lawn Distress Spray stain and glued that around the house to add some texture. Another really fun part was making the bunnies in the garden from an old Martha Stewart edge punch by punching 3 strips and gluing them together. The grass around the bunnies was painted Mowed Lawn green and then adhered to the sides of the base. 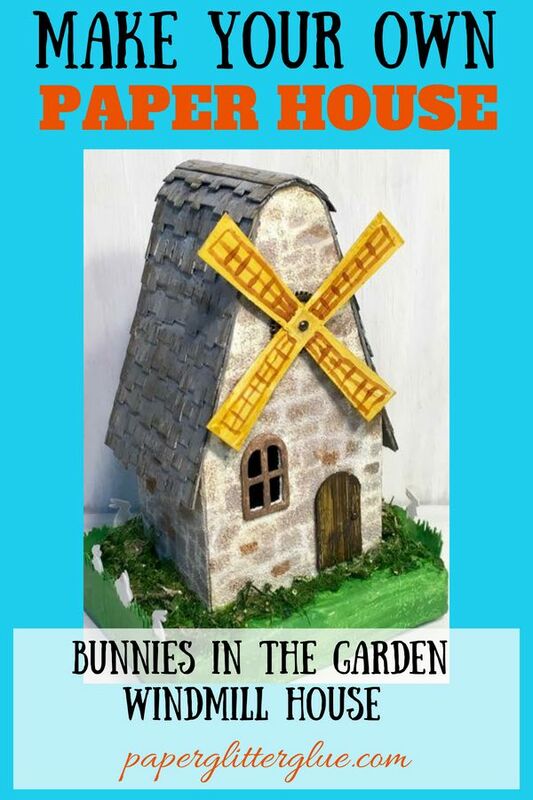 And that’s it – the Bunnies in the Garden Springtime Putz House – a fun project for this time of year. I will be sharing this project with the Simon Says Stamp Monday Challenge “In My Garden”. I hope you enjoyed reading about the process and can take some inspiration from it. Feel free to pin to your favorite board. 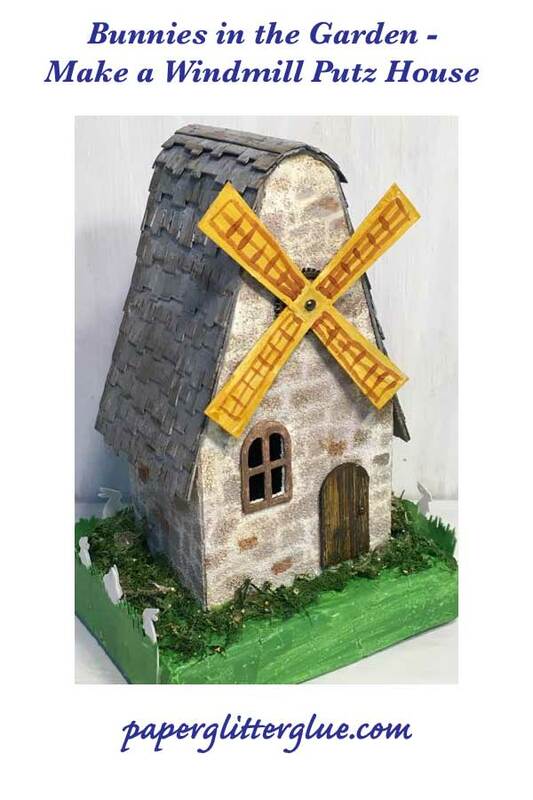 What do you think about this Candy Corn shape as a windmill house? I will be posting another Candy Corn house in the future so you can compare the designs. Thank you for reading. Lucy you are a genius! What fabulous work on these projects! Hugs! I am so intrigued by your creations. How can I follow you? I don't see the option, only email subscription. Anne, I am trying to start a new blog on the same topics so I haven't worked on getting followers on this blog. I post about once a week if you are interested and want to stop by. I will let you know when I get my new blog going. I love making little houses and am happy to share what I learn. Thank you for your comments.